Bonclarken is the Conference Center for the Associate Reformed Presbyterian Denomination. 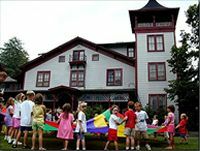 The center consists of 63 acres and was established in 1921. It is located in a very quiet and beautifully wooded area with a lake, swimming pool, open playing fields, plenty of opportunity for recreation, nice residential and meeting facilities, and excellent buffet style food service. The center is open year-round, and the facilities are made available to other Christian groups, camps, seminars, family retreats, etc. Meeting Equipment Technology Available: Video, Overhead, Slide Projectors, TV and VCR. Take Hwy. 25 North from Greenville to the Flat Rock exit. Turn left and stay on Old Hwy. 25. You will go through 2 stop lights and past the Flat Rock Playhouse on the left. The Bonclarken entrance is on the right (approximately 4 miles from the exit). Take Interstate 26 West to Exit 22. At the end of the exit ramp, turn left. Stay on this road (you will cross Hwy. 176) until it dead ends into Hwy. 25. At Hwy 25, turn left and the Bonclarken entrance will be about a 1/4 of a mile on the left. Take Interstate 26 East to Exit 22. At the end of the exit ramp, turn right. Stay on this road (you will cross Hwy. 176) until it ends into Hwy. 25. At Hwy. 25, turn left and the Bonclarken entrance will be about 1/4 of a mile on the left. Follow signs to the Conference center. You will come to a large parking lot and will see the Heidelberg Hotel to the right. The office is in the Heidelberg Hotel.